I've talked about Saugatuck Brewing Company before, way back in the early days of the blog--nearly year and a half ago. That was for a flavorful, somewhat oddball milk stout inspired by, and containing, the three unique flavors of neapolitan ice cream. I liked that beer. Now I have on hand another of the brewery's somewhat oddball milk stouts. This one's inspired by, and is made to taste like, blueberry pancakes. Does it? Well, yes. I tried a bottle of it before and fell in love immediately. However, I'm ready to sit down and give the brew the full-fledged John Likes Beer treatment. Let's get it. Saugatuck Brewing Company is based in Saugatuck, Michigan. The brewery is in the final phase of it three-phase plan. It was conceived in 2002 and, shortly after, in 2003, began as a 3.5 BBL start-up brewery. Shortly after, the company moved into a bigger space and opened a pub, which wrapped up phase two. In it's current phase, SBC offers a Brew On Premise system (where fans can craft their own beer) as well as 45 brewing barrels and 960 barrels for fermentation. To read the full history of the place, look into their history page. Blueberry Maple Stout is one of the brewery's six mainstays--beers that are available and on-tap year-round. The brew's official page says it's a sweet milk stout that "...tastes like a glass full of blueberry pancakes smothered in maple syrup." 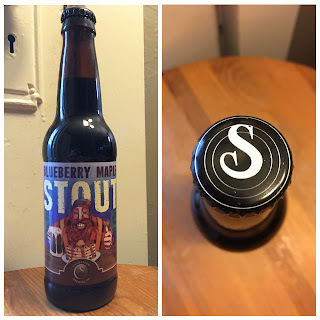 This is done through the clever usage of five different malts, two hop varieties, and (according to the bottle I have) natural flavors--no doubt blueberry and maple. Oh, I should also note that the stout boasts a 6% ABV. The nose of the beer gives off blueberry and maple. It also has a coffeeness to it that adds to the whole breakfast feel of the brew. Let me say that, in my previous encounter with the brew, that coffeeness was either absent or lost amongst the blueberry mapleness. It's definitely welcome and a cool something extra I wasn't expecting from Blueberry Maple's aroma. By the way, Purrl's not a big fan of it (the aroma, that is). She gave it two quick whiffs before ignoring the bottle I was holding out for her. If you remember my Neapolitan Milk Stout review, I was awed by the waves in which the stout's flavors came. The exact phenomenon is happing here. Blueberry in the fore, maple in the finish and lingering around on the lips. I'm happy to see that the coffee I got from the nose carries through into the taste. It's layered amongst both flavors. It tastes just like a blueberry maple pancake breakfast. This beer is thick on the mouthfeel front. Just like what you want in a milk stout. The maple flavor adds to the stouts syrupy quality (I mean syrupy in a good way. Promise). There's a healthy amount of carbonation going on, too, but it's light and plays into the filling aspect of each swig. I was never a fan of pancakes growing up. I don't know why. We had them a lot when I was younger, usually for dinner, but I never took to them. Now, however, I'm happy to say that I have seen the error of my ways. Because of that old dislike, what Blueberry Maple makes me think of isn't pancakes but blueberry waffles with maple syrup slathered on them (I've always loved waffles). Specifically, it reminds me of one morning before my junior year of college. I woke up, threw some waffles in the toaster, turned on the TV, got out some syrup, and poured it over the waffles as soon as they popped up. I then moseyed over to the TV and sat watching a rerun of King of the Hill that was playing on the west coast's Adult Swim. I knew that I had a long day of yardwork ahead of me that day. But, for that short half-an-hour I lost myself in the antics of Hank, Dale, Bill, and Boomhauer. And those blueberry waffles smothered with maple syrup. 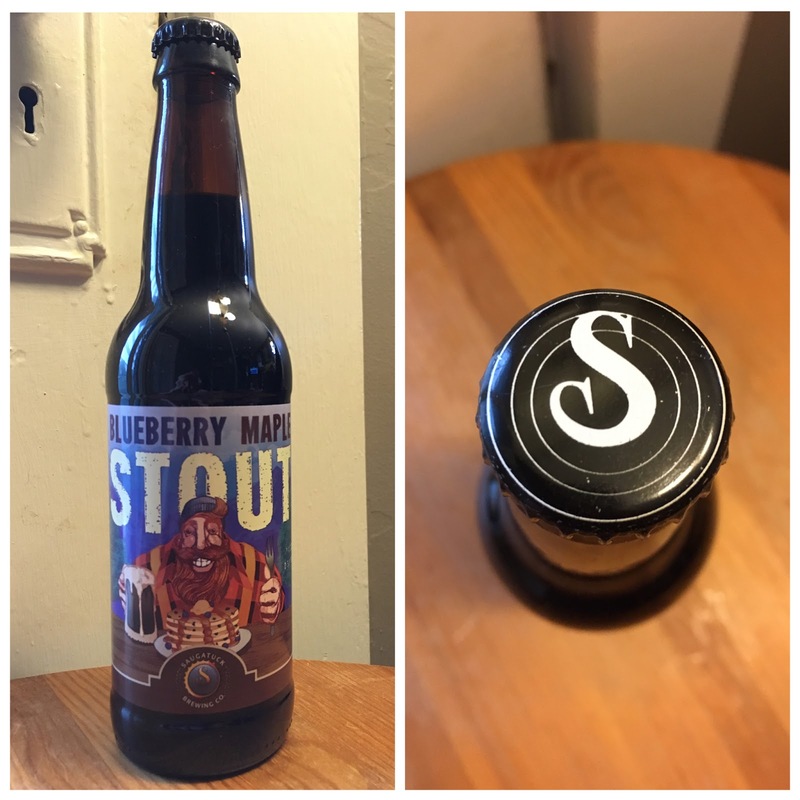 Saugatuck Brewing Company's Blueberry Maple Stout is exactly what it's advertised as being. Blueberry and Maple. Amazing, hands-down my favorite milk stout, and my new Sunday morning beer. Good on you, SBC. The brew gets a 9.5/10 from me. Buy and consume on sight.